This is the definition of Catification! Andy and his wife created this beautiful catwalk to integrate seamlessly into their home. The custom structure is elegantly crafted and painted to match the rest of the decor–and the cats obviously love it. The entire catwalk is built from basic materials from the home improvement store, so clearly Andy has some carpentry skills! There are multiple levels and big spacious hideaways with cutouts that allow the cats to survey their territory from above. All the walkways are lined with scrap carpet that can be easily removed for cleaning or replacement and the hideaways have soft blankets inside for maximum coziness. I love how some of the shelves span across the windows, giving the cats a fantastic view of the yard. 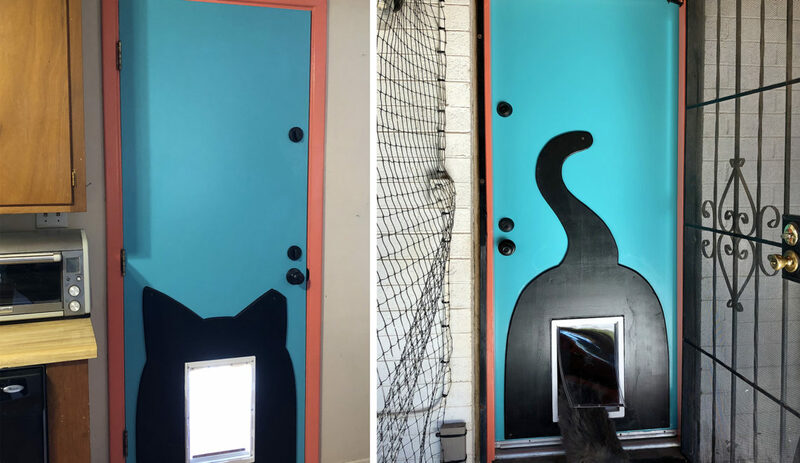 This is such a well-designed and perfectly executed Catification project, it makes my heart happy! WOW, my 8 cats would love love love this…. This is a wonderful catification and I can see it continuing out the French doors into a catio! I love this. I wish my cats could have this. love it. the problem with my cats would be when they barf, how long would it be before i found it. i’d have to be up on a ladder checking all the time just to make sure. worse, if they barfed over the side lol. How true. But does it really matter when you can easily change the carpet.’ There are plenty of places where you can get small remnants of carpet cheaply, even bound if you want. Maybe you could add gutters… LOL! Seriously, though, the likelihood of one of my cats barfing over the edge is what’s stopped me from putting up shelves for them, and a wall shelf only has 1 available edge. I shudder to think of what a mess they could make with 2 sides to barf from. This walkway setup *is* gorgeous, though, and really well done – kudos to Andy & his wife for creating such a fantastic environment for their cats! that was my second thought too. first thought was how cool it all is.